The beauty of Trillium Lake and the expansive view of Mount Hood is not what you would expect from a cross-country skiing route so close to the highway. While it's a popular destination for families, photographers, and fishermen during the warmer months, Trillium Lake is truly magical in the winter, when the evergreen trees are covered in snow, the lake is frozen, and everything around is quiet and still. Not to mention the view of the thick, white mountain in the background is something else. 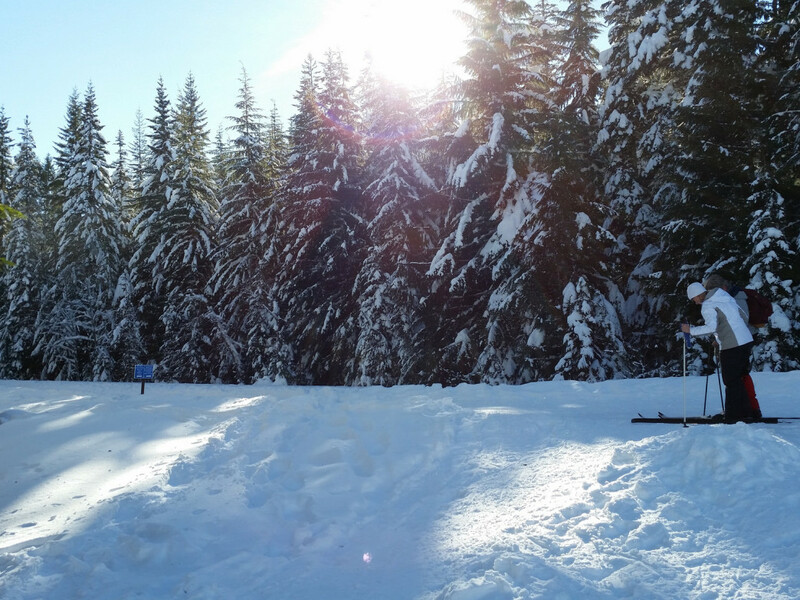 It's hard to find somewhere to cross country ski near Portland that is this picturesque. 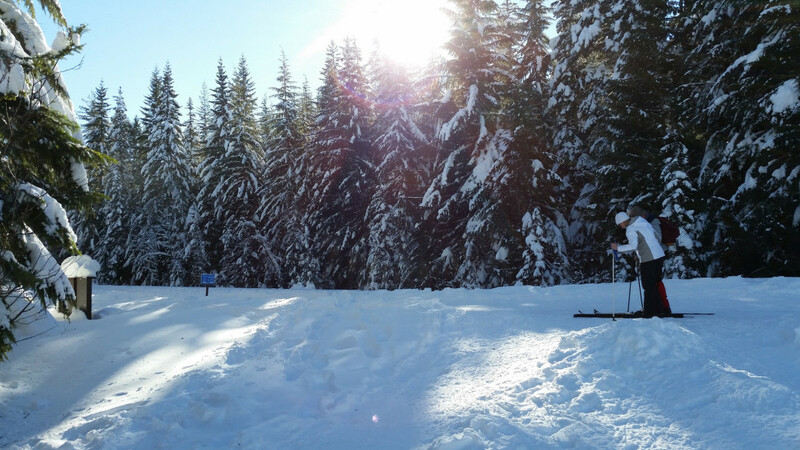 It is one of the best-known routes by Mount Hood for both cross country skiers and snowshoers. It is a suitable trail for anyone, no matter the experience level. It is just over an hour away from Portland and conveniently right off the highway, yet yields one of the most spectacular views of Mount Hood in the area. The grand view of Mount Hood opens up just 2 miles from the trailhead, if you decide to start by going straight on the loop trail. While on this trail, you'll be surrounded by evergreen trees layered with snow. The peaceful quiet that is found in any snow covered area is not in short supply here, even though it is so close to the road. It is a quick and easy escape in the winter from the generally rainy and sometimes noisy city. 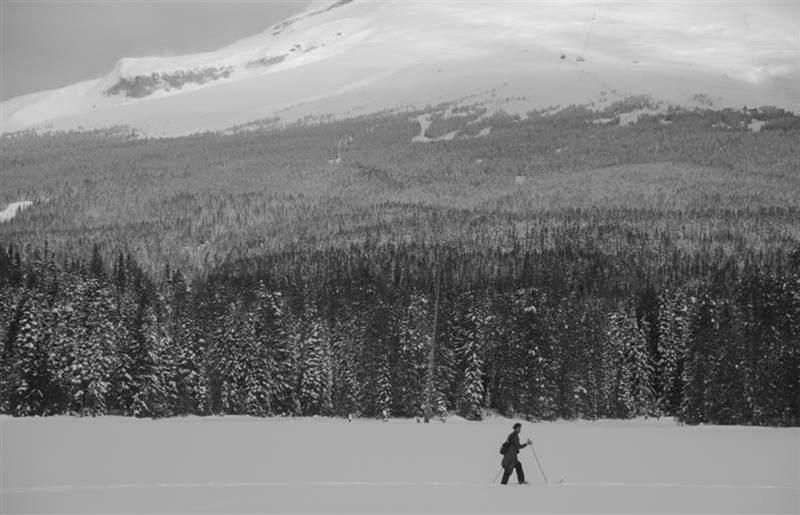 The trail around Trillium Lake is a snow-covered road, which makes it accessible for all levels of cross country skiers. There is an initial dip in the trail at the start that can be challenging for beginners and should be approached with awareness, but other than that, there is very little elevation gain or loss on this trail. It can be a 5-mile loop, which makes it a great route for beginners or a short, easy day trip for more experienced skiers. If you wanted to make it a longer day, there are several smaller, off-shoot trails that are surprisingly well-signed. These trails are generally not overcrowded, though this loop tends to be very well traveled by snowshoers and cross country skiers alike, especially on the weekends. The most popular trails are groomed on a weekly basis and are perfect for classic skiing. To get to Trillium Lake from Portland, take Highway 26 toward Government Camp. Trillium Lake is located across the street from the Snow Bunny Lodge. Park in the provided lot and take the wide road. A Sno-Park pass is required. The loop junction is encountered after about a half mile on the wide trail.Most people continue straight and come across the beautiful view of Mount Hood in about 2 miles. After passing the Trillium Lake Campground, you will pass Mud Creek Ridge Road, which is an 8 mile loop option that provides expansive and breath-taking views of the area, along with another incredible view of Mount Hood. If you do not want to extend your loop, continue straight and after the viewpoint, cross the dam to continue the loop around the lake. Head toward the Westside divide and bear right for Summit Meadows, which is another scenic spot, as if the last one was not enough. Bear right after Summit Meadows and continue the last half-mile to complete the route.